Yes, we have introduced quite a few Dianella, or flax lily, over the last few years. However, there is one that is proving as elusive as it is exciting: Dianella tasmanica ‘NPW2’ “Blaze”. During the cool months, this selection has great maroon or purple hues throughout the foliage and, in some climates, appears almost completely purple! In milder weather, the chlorophyll abounds and the plant transitions to predominantly green with slight tones of red which is also a nice look. Dianella Blaze, winter color. Taken in Australia in 2006. We’ve been working on it for about 5 years now…trialing it here in the US for the last 4 or so…and like what we see!! The only problem is we can’t get enough :(… Unlike most of our other Dianella, Blaze simply is not working in tissue culture so we are relegated to the slower division process. Oh well, nothing good comes easy, right? But, yes, this stinks and definitely makes it harder. 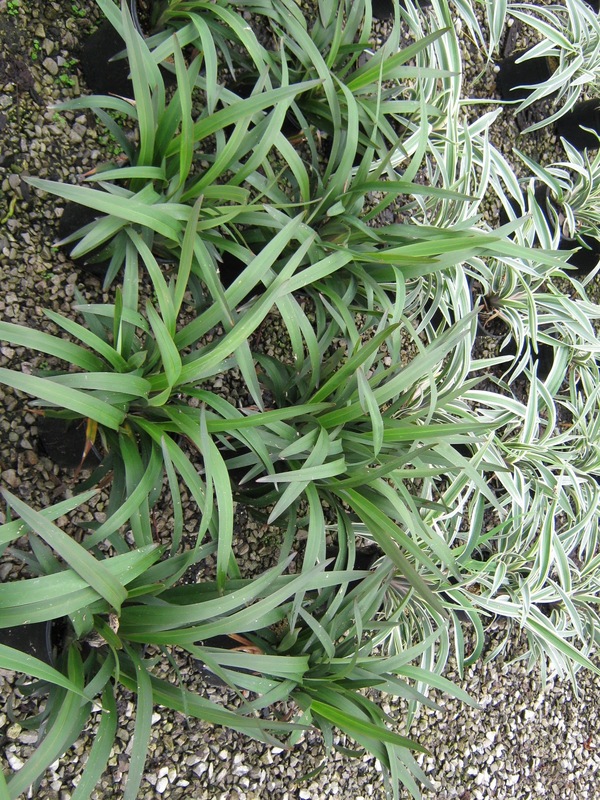 Some of the original trial plants at Flowerwood, picture taken in early April 2010. Overwintered in a cold frame and still showing a good bit of the purple. The guys decided to leave one outside to see how it went through a Zone 9 winter. If you remember, winter of 2009/2010 saw some pretty severe cold snaps. All in all, it went through pretty well and obviously showing the maroon/purple! Flowerwood trials, May 2012. They’ve expanded! And the plant are looking good! NOTE: the two reversion plants in the foreground, left. We note a very small reversion rate; these plants would be tossed!